Sky Plus review | What Hi-Fi? You might well have to fit a satellite dish and will certainly have to pay a monthly subscription fee (additional channels, at extra cost, will also be an option), but the pros of the Sky+ receiver outweigh the cons in much the same way that Oprah outweighs Trisha. the best user interface you'll find on a product of this type. The Electronic Programme Guide (EPG) is impressive, giving you as much as a week's advanced TV scheduling on a simple menu. The system can be set to record an entire series - even if the future shows are weeks in advance - and will do so even while you watch something different. laws of physics by pausing live TV transmissions and returning to them when it's convenient for you. 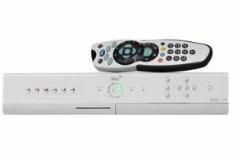 Along with two Scarts, the Sky+ digibox has an optical digital output, a particular benefit with the Sky Movie channels, which frequently broadcast audio in Dolby Digital 5.1. As a result, soundtracks sound spec--t--acular and deliver full surround sound. The Sky+ receiver's picture is similarly outstanding, with digital noise being all but eradicated, motion-tracking calm and cohesive, and images full of bright, vibrant colours. Contrast is excellent, too: even areas of shadow are -rendered competently and clearly with -subtlety and detail. This is a cracking receiver for not much money. The Sky+ system is the cheapest way to both watch and record satellite TV, so it's good that the implementation matches up to the promise. Yes, it involves subscribing to one or more of Sky's premium channels, but the chances are, despite having to pay, you'll find it addictive. We certainly do!